The chief features of the bench-top generator units are their mobility, ruggedness, variety of applications and easy maintenance. Their 100-percent solid-state design makes the new generators a cost-effective alternative to less efficient tube-type units. They can be used both on the production floor and in laboratories and workshops. The output power remains stable even in the event of input-line fluctuations. The generator automatically regulates the current so that the maximum value is not exceeded. It therefore does not shut down, even when operating under a heavy load. The output power can be regulated to suit either high-voltage loads or strong current. The oscillator and the control unit are housed in separate casings. The only electrical connections are a DC cable and a control cable. This makes it possible to use the oscillator at a considerable distance from the control unit. Shortening or lengthening the cable does not produce either tuning problems or parasitic oscillations. This is particularly important when using the generator under extreme conditions. Moreover, the oscillator unit can be used in any position. The oscillator and control unit can also be housed in a single casing if preferred. In order to increase the mobility of the generator still further, a specially adapted heat exchanger is available on request as an accessory. 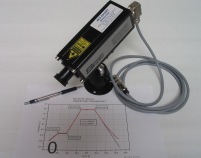 The variable frequency range of 100-400 kHz allows a variety of applications. Owing to the self-oscillating principle on which the generator is based, tuning problems can be avoided and matching elements are not needed. The user can easily adjust the new heating coil to suit different applications. An automatic frequency monitor shuts down the generator if the permissible range is exceeded. There are, however, a large number of other special applications about which we would be most happy to advise you. The generator is equipped with a built-in timer, which can be set to the required operating time. A foot pedal allows convenient operation. In a production line the generator can be turned on and off by using a separate switch, which can also be linked to the built-in timer. The generator can withstand both no-load conditions and short circuits. The fast-reaction electronics protect the MOS transistors from overloading. The coolant flow-rate is monitored. The generator shuts down automatically if the coolant flow-rate is too low or if the temperature of the coolant is too high. The generator consists of several modules, each of which can be separately replaced. Operational faults are displayed on the front panel. The temperature control unit allows objects and materials to be heated as required. The temperature can be constant or can be increased gradually. The desired temperature can be entered using the command keyboard of the temperature control unit. The user can choose from 50 different combinations of time and temperature settings. The keyboard and the display panel are integrated into the control unit of the generator. 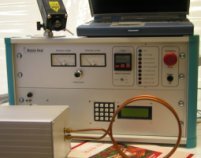 The temperature is measured using an infra-red pyrometer chosen according to customer specifications regarding material properties and temperature range. The temperature data are digitalised and can be immediately displayed and processed in an evaluation program that will run under any Windows operating system. The data are read into the computer via an RS 232 interface attached to the control unit. Unlike tube technology the MOS-transistors in solid-state generators give off little heat owing to their high efficiency. However, for reliable oscillations RF- generators require a tank circuit with a high Q value. The resulting reactive currents and the often immense heat radiating from the object being treated make water cooling of the tank circuit necessary. 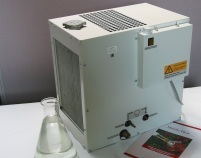 The optional heat exchanger makes your RF-heating unit into a mobile system That's why it is called "Mobile Heat"